Some of the 4-H leaders and advisors recognized are, from left, Vanessa Gingerich, Brian Gingerich, Jacob Serio (4-H Alumni) Manny Heilman (4-H Member), Gene Dumbaugh, Lynn Fraizer, Kim Hessey, harlene Pace, Bill Hershner (Back), Lee Van Dyke, Carol Holsinger, Renee Ness, Betty Brandum. Amanda Forquer, 4-H educator, jokes with Bill Hershner if she has picked out the best clover keychain to give him since he is the most tenured 4-H volunteer with 59 years of service. At left Becky Barker, 4-H educator, is announcing and Jacob Serio is helping to present awards. 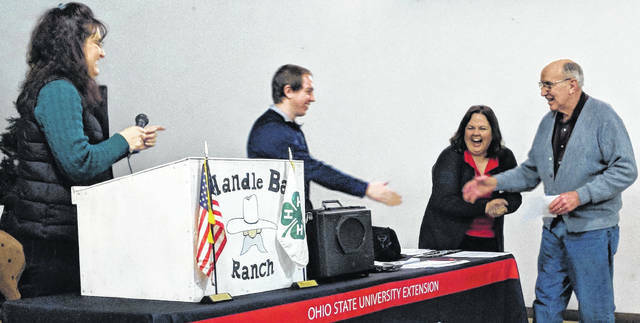 MOUNT GILEAD — Northmor grad and OSU student Manny Heilman opened the Jan. 18 Extension recognition program, speaking about his 10 years in 4-H as a member and more recently as a 4-H Junior Leader. Heilman said he could never speak in front of people until he needed to do a demonstration for his 4-H club. One of his first demonstrations was on how to make scrambled eggs. He was able to take the demonstration all the way to the Ohio State Fair. This is Heilman’s 11th year in 4-H and he has signed up for 15 projects this year. “I’m very thankful for 4-H and thankful for my mom’s and advisor’s support,” Heilman said. 4-H Junior Leader Jacob Serio followed Heilman and spoke about his love for the program. Serio is a Highland graduate and an OSU student majoring in political science. “4-H is the family I never had,” Serio said. He thanked leader Russ Mayer and Advisor Lynn Wagner for their teaching and caring. He said Wagner allowed him to raise his goats at her place since he couldn’t have them at home. He had as many as 30 goats there. Serio said his trip to Citizenship Washington Focus Conference lead to his interest in politics. His experience on Junior Fair board and leadership camp have been valuable in his growth and learning. “I am thankful for the 4-H advisors who make this learning and growth possible,” Serio said. OSU Extension Educator Becky Barker thanked the 81 volunteers at the program held at Handlebar Ranch. Some of the numbers for the 2018 OSU Extension programs in Morrow County are: 3,276 youth in 4-H projects, programs, events or activities, 301 4-H volunteers and advisors, 389 Youth who participated in Farm Safety Day, 277 youth involved in workforce preparation and skill development, 257.5 miles of county and township roads were cleaned by 4-H clubs, and a record number of 285 youth attended 4-H Camp in 2018. Extension Educator Carri Jagger spoke about Extension agriculture and natural resources programs that included 63 farmers who attended Beef Quality Assurance training, 88 educational classes offered to Morrow County Residents, 34 visits to residents’ homes to help with diagnostics of problems with crops or plants, 38 people who attended pesticide applicator re-certification training and 35 attended fertilizer certification training. Jagger also recognized the 9 Master Gardener volunteers trained in 2018. Candace Heer, OSU Education for Family and Consumer Science thanked volunteers who helped with 126 participants who attended 17 lessons on Health and Wellness, 459 residents received information on being sun safe, and 167 eighth graders from three schools participated in Real Money, Real World.